Aug. 7 (Bloomberg) -- Crude oil traded near $72 a barrel, poised for a fourth weekly gain on optimism the outlook for a global economic recovery has improved. Oil is set to rise 3.2 percent this week as U.S. equities gained and the dollar weakened, increasing investor demand for commodities priced in the U.S. currency. The Standard & Poor’s 500 Index reached a nine-month high on Aug. 5. Crude oil for September delivery traded at $71.70 a barrel, down 24 cents, on the New York Mercantile Exchange at 9:23 a.m. in Singapore. Yesterday, the contract fell 3 cents to settle at $71.94. Futures have gained 61 percent this year and climbed 20 percent in the past four weeks. Aug. 7 (Bloomberg) -- Crude oil was little changed near $72 a barrel after U.S. equities dropped and the dollar strengthened, reducing the appeal of commodities as an alternative investment. U.S. stocks declined after a JPMorgan Chase & Co. downgrade sent health-care companies lower and concern grew that the market’s recent rally outpaced the economy’s prospects. U.S. crude-oil stockpiles climbed 1.67 million barrels to 349.5 million last week, an Aug. 5 Energy Department report showed. Crude oil for September delivery traded at $71.89 a barrel, down five cents on the New York Mercantile Exchange at 9:48 a.m. Sydney time. Yesterday, the contract fell 3 cents to settle at $71.94. Prices are up 3.31 percent this week, headed for a fourth week of gains. The Standard & Poor’s 500 Index dropped 0.8 percent to 994.63 in New York and the Dow Jones Industrial Average fell 57.66 points, or 0.6 percent, to 9,223.31. The dollar gained versus the euro yesterday on speculation traders canceled bets against the dollar before a U.S. Labor Department payroll report today. The report is projected to show the jobless rate rose to 9.6 percent in July from 9.5 percent in June, according to a Bloomberg News survey of economists. The U.S. currency traded at $1.4370 per euro at 10:01 a.m. Sydney time, from $1.4345 yesterday. The Organization of Petroleum Exporting Countries will increase crude shipments for the first time since June, according to consultant Oil Movements. OPEC will raise deliveries by 0.4 percent in the four weeks ending Aug. 22, the tanker tracker said yesterday, as higher prices encourage members to exceed production quotas. Brent crude oil for September settlement fell 68 cents, or 0.9 percent, to $74.83 a barrel on London’s ICE Futures Europe Exchange yesterday. Aug. 6 (Bloomberg) -- Gold fell from a two-month high as the dollar rose, cutting demand for the precious metal as an alternative investment. Silver declined. The U.S. Dollar Index, a six-currency gauge of the greenback’s value, advanced after a government report showed the number of U.S. workers making initial claims for jobless benefits fell more than economists estimated, a sign that some employers have stopped trimming jobs as the recession ebbs. Bullion typically falls when the dollar strengthens. “The firmer dollar is putting slight pressure on gold,” said Ralph Preston, a Heritage West Futures Inc. analyst in San Diego. “Gold’s direction will be all about the dollar and where it goes from here. Gold futures for December delivery slid $3.40, or 0.4 percent, to $962.90 an ounce on the New York Mercantile Exchange’s Comex division. Earlier, the most-active contract reached $974.30, the highest since June 5. Bullion for immediate delivery slipped $2.26, or 0.2 percent, to $961.20 an ounce at 6:55 p.m. in London. Earlier, the price advanced to $971.68 an ounce, the highest since June 5. Silver for September delivery dropped 11.5 cents, or 0.8 percent, to $14.645 in New York. Earlier, the metal surged to $15.035, the highest since June 12. “Gold is bullish, and only a close under $945 an ounce hints at a turn to lower prices,” Preston said. “A close over $970 should accelerate rallies” and prices may reach $993, he said. The metal rose to $964 in the London afternoon “fixing,” the price used by some mining companies to sell their output, from $960.75 in the morning fixing. Spot prices are heading for a fourth consecutive weekly gain. The dollar index climbed as much as 0.8 percent. “Gold prices continue to track the dollar as longer-term investment buying takes a back seat for now,” Natalya Naqvi, a Barclays Capital analyst, said today in a report. In the gold market, pressure also comes “from signs of exhaustion in risk appetite and from weak fundamentals,” Tom Pawlicki, an MF Global Inc. analyst in Chicago, said in a note. HSBC Securities raised its forecast of average gold prices for this year by 5.7 percent to $925 an ounce. “Strong investor demand, potentially volatile commodity prices, weak jewelry demand, sluggish mine output and heavy scrap sales” will keep gold in a wide and volatile range, James Steel, a New York-based analyst, said yesterday in a report. Aug. 7 (Bloomberg) -- The yen fell versus 10 of the 16 most-actively traded currencies on speculation a U.S. report will show companies cut fewer jobs last month, spurring investors to seek higher-yielding assets abroad. Japan’s currency also weakened after U.S. initial jobless claims declined more than economists estimated. The pound may decline for a second day versus the dollar and the euro after the Bank of England said the U.K. recession is deeper than previously estimated. Australia’s dollar is poised to rise a fourth week versus the greenback and the yen on expectations the Reserve Bank of Australia will upgrade growth forecasts. The yen weakened to 137.08 per euro as of 9:23 a.m. in Tokyo, from 136.94 yesterday in New York, when it slid 0.1 percent. It traded at 95.42 per dollar from 95.46. The Australian dollar was little changed at 84.01 U.S. cents from 83.95 cents yesterday. It bought 80.14 yen from 80.13 yen. The pound traded at $1.6797 from $1.6783 yesterday in New York, when it slid as much as 1.4 percent in the biggest intraday drop since July 6. Against the euro, the pound was at 85.53 pence, from 85.49 pence yesterday, when the British currency fell 0.8 percent in its first retreat in nine days. The U.S. lost 325,000 jobs in July, slowing from a reduction of 467,000 in the prior month, according to the median forecast of 82 economists in a Bloomberg News survey. The unemployment rate will increase to 9.6 percent, according to a separate survey. The report is due at 8:30 a.m. in Washington. Goldman Sachs Group Inc. lowered its forecast yesterday for U.S. job losses in July to 250,000 from 300,000. The bank maintained its forecast for an unemployment rate of 9.7 percent. Investors should buy the euro against the pound after the Bank of England yesterday expanded its asset-purchase program by 50 billion pounds ($84 billion) to 175 billion pounds, according to Morgan Stanley. The central bank’s move suggests policy makers, who based the decision on quarterly forecasts prepared this month, assessed that their stimulus plan and record low interest rates weren’t enough to fight a recession that’s deeper than previously anticipated. The U.K. economy contracted at a faster pace in the second quarter than previously estimated, the National Institute of Economic and Social Research said on Aug. 5, changing its estimate to a 0.8 percent drop from a 0.4 percent decrease. Morgan Stanley said it went long the euro at 85.50 British pence yesterday, with a target of 90.00 pence and a stop-loss order at 84.00 pence. A long position is a bet an asset will strengthen. A stop-loss order is an automatic instruction to sell or buy a currency should it reach a particular level. Australia’s dollar traded near the highest level since September versus the U.S. dollar after a report yesterday showed the number of people employed in the South Pacific nation rose by 32,200 from June. Economists had forecast a decline. “Following the surprising good news on the labor market, traders priced in almost half another 25 basis point-rate hike by year-end, which has provided the Aussie with significant support on the crosses,” John Kyriakopoulos, Sydney-based head of currency strategy at National Australia Bank Ltd., wrote in a report today. Australia’s currency may strengthen to 86 U.S. cents over the next week or so, he said. FKLI Aug Futures contract surge 8.5 points to settle at 1185.5 levels as compare to previous trading session to with a total of 5,396 lots traded in the market. FKLI was traded strong as Dow Jones manage to recover from major losses during trading overnight trading while regional indices were traded strong upon closing. Technically, FKLI manage to break previous levels at 1182 and closed at 1185. 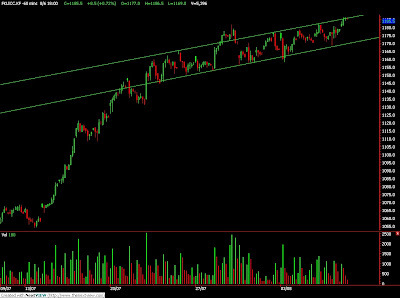 A short term uptrend channel formed in the hourly chart where 1186 seems touching the resistance trend line. Based on our technical analyst, our opinion suggest FKLI would trade within the uptrend channel provided not to break up above the trend line where resistance seen 1187 while next resistance seen at 1200 regions. 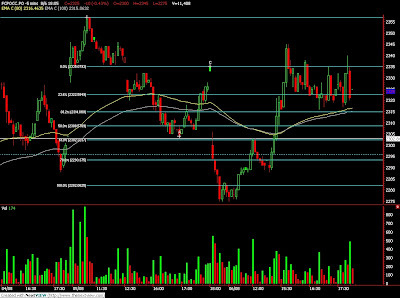 Traders were advice to hold short position as we think FKLI would retrace while trading within the range. CPO 3rd month Oct futures contract close RM10 points lower as compare to previous trading session to close at RM2325 with a total of 11,408 lots traded in the market. CPO price were traded towards high side after opened lower around RM2300 levels despite soybean oil and crude oil electronic trading were traded weak. Technically, CPO price manage to reach 100% Fibonacci projection support levels at RM2280 regions and manage to rebound 78.6% Fibonacci retrace levels at RM2340 regions. Based on our technical interpretation, our opinion suggests CPO currently is very critical for trend reversal point as resistance levels at RM2340 and RM2388 must not be breached in order for bear market to intact while support levels at RM2300 and RM 2170 was critical support levels for bull market to remain intact. Traders were advice to hold on entry until further confirmation on trend direction. Aug. 6 (Bloomberg) -- Palm oil futures dropped, ending the longest rally in six months, as crude oil prices eased, reducing its appeal as an alternative fuel. Futures declined after oil fell from a seven-week high after crude stockpiles in the U.S., the largest energy-using nation, increased as refiners reduced processing. Vegetable oils, which are used as biofuels, often track crude. “There has been a powerful rally,” and now this is a correction, said Nirgunan Tiruchelvam, a plantation analyst at RBS Asia Securities Singapore Pte., by telephone. October-delivery palm oil dropped as much as 2.6 percent to 2,275 ringgit ($652) a ton on the Malaysia Derivatives Exchange and was at 2,303 ringgit by the 3:14 p.m. Futures advanced more than 10 percent in the previous five days, the longest gain since the period ended Feb. 10. Still, as long as crude stays above $70 a barrel, confidence in palm oil prices staying high will remain as demand in China and India, the largest markets, is strong, Tiruchelvam said. Supplies may be curbed because of lower yields from tree stress, less use of fertilizer and unfavorable weather, he said. Crude oil in New York dropped as much as 1.1 percent to $71.19 a barrel and was last traded at $71.65 a barrel. Crude prices above $70 oil would spur demand for bio-diesel that could drive palm oil prices above $800 by the year-end amid tight supplies, James Fry, managing director of UK-based agricultural industry consultant LMC International Ltd., said Aug. 3. Palm oil has gained 35 percent this year, as drought curbs soybean crops in South America. Soybean oil and palm oil are substitutes. The U.S., the largest soybean grower ahead of Brazil and Argentina, will release data on its soybean crop next week. Aug. 6 (Bloomberg) -- Oil fell from a seven-week high after equities declined and a government report showed an increase in crude stockpiles in the U.S., the largest energy-using nation. The Standard & Poor’s 500 Index fell from a nine-month high after reports on U.S. job losses and service industries were worse than economists forecast. Oil also dropped after an Energy Department report released yesterday showed a bigger-than- estimated rise in crude stockpiles. Crude oil for September delivery fell 37 cents, or 0.5 percent, to $71.60 a barrel on the New York Mercantile Exchange at 10 a.m. Sydney time. Yesterday, the contract rose 55 cents, or 0.8 percent, to settle at $71.97, the highest since June 12. Oil advanced yesterday after the Energy Department report showed that fuel supplies dropped as consumption increased. Fuel demand climbed 3.1 percent to 19.3 million barrels a day last week, the highest since February. The S&P 500 declined for the first time in five days, slipping 0.3 percent to 1,002.72 in New York. The Dow Jones Industrial Average fell 0.4 percent to 9,280.97. Crude-oil stockpiles climbed 1.67 million barrels to 349.5 million last week, according to the Energy Department report. A 600,000-barrel gain was forecast, according to analysts in the Bloomberg News survey conducted before the report’s release. “I think the overall level of inventories is still high,” Moore said. The Institute for Supply Management’s index of service industries in the U.S., which makes up almost 90 percent of the economy, fell to 46.4 from 47 in June, the Arizona-based group said yesterday. The index was projected to rise to 48, according to the median of 77 responses in a Bloomberg News survey. The report from ADP, the world’s largest payroll processor, was predicted to show a 350,000 drop in jobs, according to the median estimate in a Bloomberg survey. The Labor Department’s July jobs report is due Aug. 7. The U.S. has lost 6.5 million jobs since the recession began in December 2007, the biggest decrease of any economic slump since the Great Depression. Brent crude oil for September settlement fell 39 cents, or 0.5 percent, to $71.58 a barrel on London’s ICE Futures Europe Exchange at 10:07 a.m. in Sydney. Yesterday, it rose $1.23, or 1.7 percent, to $75.51. U.S. supplies of distillate fuel, a category that includes heating oil and diesel, fell 1.14 million barrels to 161.5 million, the Energy Department report said. Inventories were projected to increase 1.23 million barrels, according to the median of 16 responses by analysts in the Bloomberg News survey. Gasoline inventories declined 218,000 barrels to 212.9 million last week, the report showed. An 800,000-barrel drop was forecast, the survey showed. Gasoline for September delivery dropped 0.6 cent, or 0.3 percent to $2.0452 a gallon in New York at 8:38 a.m. Sydney time. Yesterday, it declined 0.55 cent, or 0.3 percent, to end the session at $2.0512. Aug. 5 (Bloomberg) -- Soybeans rose for a fifth session on speculation that demand for the crop will improve as food makers seek a cheaper alternative to palm oil, which jumped to a six- week high in Malaysia. Palm-oil futures climbed 11 percent in the past five sessions, the longest rally since Feb. 10, as higher energy prices boosted its appeal as a source of biofuel. The dollar’s 3.6 percent slide against a basket of six major currencies since July 3 is making U.S. commodities cheaper for buyers abroad. The U.S. is the world’s biggest soybean grower and exporter. Soybean futures for November delivery rose 13.5 cents, or 1.3 percent, to $10.45 a bushel on the Chicago Board of Trade. The most-active contract, up 14 percent since July 29, has climbed 6.6 percent this year on increased demand and lower stockpiles. Palm-oil futures for October delivery touched 2,357 ringgit ($674) a ton on the Malaysia Derivatives Exchange, the highest since June 18, before closing at 2,335 ringgit, up 1.3 percent. Corn is the biggest U.S. crop, valued at $47.4 billion in 2008, followed by soybeans at $27.4 billion, government figures show. The U.S. is the world’s largest exporter of both. Aug. 5 (Bloomberg) -- Gold prices fell, ending a four- session rally, as energy costs dropped, eroding demand for the precious metal as a hedge against inflation. Silver gained. Crude-oil futures slid as much as 2.4 percent before erasing losses later in the day. The dollar fell as much as 0.4 percent against a basket of six major currencies. Yesterday, gold reached the highest since June 5. Gold futures for December delivery declined $3.40, or 0.4 percent, to $966.30 an ounce on the Comex division of the New York Mercantile Exchange. The contract climbed 4.3 percent in the previous four sessions, the longest rally since June 26. U.S. services industries declined at a faster pace last month than in June, while companies cut another 371,000 jobs, separate industry reports showed today. The data signal rising unemployment that may erode spending. The U.S. Labor Department is set to report on July employment on Aug. 7. “Jewelry demand remains very quiet,” John Reade, UBS AG’s head metals strategist in London, said today in a report. Bullion for immediate delivery fell $1.16, or 0.1 percent, to $965.79 an ounce at 8:41 p.m. local time. The spot price gained 3 percent last month as the dollar dropped 2.2 percent against the currency basket. Metals will remain “reliant on further dollar weakness and equity strength to fuel additional gains,” Moore said. Silver futures for September delivery advanced 6.5 cents, or 0.4 percent, to $14.76 an ounce in New York. Aug. 6 (Bloomberg) -- The yen may rise for a third day versus the dollar and the euro on speculation stocks will extend losses after U.S. reports added to doubts the global recession is easing. Japan’s currency gained against all 16 most-actively traded counterparts as U.S. service industries contracted at a faster pace and companies cut more jobs than economists forecast, triggering share declines. The U.S. dollar advanced for a second day versus New Zealand’s as a report showed South Pacific nation’s unemployment surged to the highest since 2000. “The bias is for the yen and the dollar to strengthen,” said Sue Trinh, a Sydney-based senior currency strategist at RBC Capital Markets. “Equity markets are looking pretty tired. The risk is that given that we’ve come up a long way very fast Capital Markets. “Equity markets are looking pretty tired and if we don’t see fresh upward momentum then there’ll be a lot of frustrated longs throwing in the towel.” A long position is a bet an asset will rise. The yen traded at 94.96 against the dollar at 8:01 a.m. in Tokyo, from 94.97 yesterday in New York, when it gained 0.3 percent. Japan’s currency was at 136.80 per euro from 136.79. The dollar was little changed at $1.4416 per euro after touching $1.4447 yesterday, the weakest level since Dec. 18. Australia’s currency bought 84.11 U.S. cents from 84.06 cents yesterday and traded at 79.88 yen from 79.82. The New Zealand dollar weakened to 67.20 U.S. cents from 67.29 yesterday. 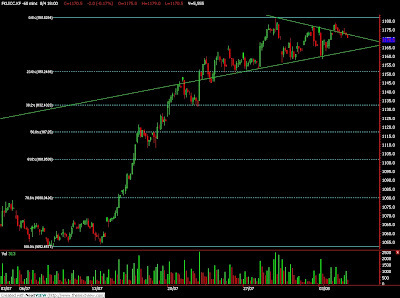 It fetched 63.82 yen from 63.90. The Standard & Poor 500 Index futures fell 0.4 percent in New York, the second day of losses. The MSCI Asia Pacific Index of regional shares, which has climbed for five-straight months, sank 1 percent yesterday. U.S. companies cut an estimated 371,000 workers from payrolls last month after a revised reduction of 463,000 in June, ADP Employer Services reported yesterday. The median forecast of 30 economists in a Bloomberg News survey was for a drop of 350,000. The Labor Department’s data on U.S. initial jobless claims for last week are due today, and its July payroll report will come tomorrow. The Institute for Supply Management’s index of U.S. non- manufacturing businesses, which make up almost 90 percent of the economy, fell to 46.4 in July from 47 in the previous month, according to the Tempe, Arizona-based group. Fifty is the dividing line between expansion and contraction. Mexico’s peso strengthened yesterday beyond 13 versus the dollar for the first time since June 1 after Moody’s Investors Service affirmed the government’s bond ratings and stable outlook, damping speculation the nation will suffer its first downgrade since 1995. Morgan Stanley recommended yesterday that its clients add to their bets that the peso will advance versus the dollar, saying the Moody’s affirmation “adds to the positive momentum.” Morgan Stanley expects a “longer-term” move to 12 per dollar, strategists wrote in a research note. The peso gained as much as 1 percent to 12.9981. The pound may strengthen against the dollar as economists expect the Bank of England to keep its main rate at 0.5 percent. The ECB will probably maintain its benchmark at 1 percent, according to separate survey. FKLI Aug Futures contract rose 6.5 points to settle at 1177 levels as compare to previous trading session to with a total of 6,479 lots traded in the market. FKLI was traded wild during trading session as regional indices and Dow Jones futures were traded within wide range while Europe market were trade mix on opening. Technically, FKLI breached new high by 0.5 point higher but was traded lower since due to lack of follow through buying interest, view from volume transacted. Based on our technical interpretation, our opinion suggests 1182.5 was a false break. However, 1182.5 high was taken as beginning of correction wave count provided resistance levels at 1179 and 1182.5 were not violated. 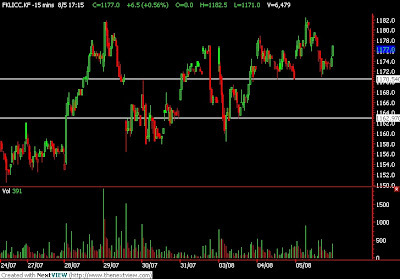 Traders were advice to hold short position once support levels at 1170 and 1163 were breached. Technically, CPO managed to breach previous high resistance levels at RM2349 levels but manage to close around RM2346 regions on hourly chart. Based on our technical view, our opinion suggests CPO is possible reverse to uptrend. However, further confirmation needed from the coming price traded. On short term basis, traders were advice to hold long on pull back provided support levels at RM2244 and RM2170 were not violated while resistance levels were seen at 2350 and RM 2388 regions. Aug. 5 (Bloomberg) -- Oil rose after an industry-funded report showed a decline in crude inventories in the U.S., the world’s biggest energy consumer, and equities gained for a fourth day. The American Petroleum Institute said supplies fell 1.52 million barrels last week. An Energy Department report today will probably show stockpiles rose 600,000 barrels, according to analysts surveyed by Bloomberg News. Oil-supply totals from the API and DOE moved in the same direction 76 percent of the time over the past four years, Bloomberg data shows. Crude oil for September delivery rose as much as 45 cents, or 0.6 percent, to $71.87 a barrel on the New York Mercantile Exchange, and was at $71.63 at 10:10 a.m. in Sydney. Yesterday, oil dropped 16 cents, or 0.2 percent, to settle at $71.42. U.S. stocks rose after pending sales of existing homes increased more than forecast in June. The Standard & Poor’s 500 Index added 0.3 percent to 1,005.65. The Dow Jones Industrial Average climbed 0.4 percent to 9,320.19, and the Nasdaq Composite Index advanced 0.1 percent to 2,011.31. Oil also gained as the U.S. currency weakened. The dollar traded at $1.4396 per euro at 7:45 a.m. in Tokyo, from $1.4408 in New York yesterday. A drop in the U.S. currency bolsters the appeal of commodities as a hedge against inflation. Gasoline inventories increased 2.1 million barrels to 215.7 million in the week ended July 31, the API report showed. Crude stockpiles declined to 350.9 million, the report said. The Energy Department is scheduled to release its weekly report today at 10:30 a.m. in Washington. Gasoline for September delivery fell 0.64 cents, or 0.3 percent, to $2.0503 a gallon in New York at 8:59 a.m. Sydney time. Yesterday, it declined 1.26 cents, or 0.6 percent, to end the session at $2.0567. Brent crude oil for September settlement rose 37 cents, or 0.5 percent, to $74.65 a barrel on London’s ICE Futures Europe Exchange at 10:13 a.m. in Sydney. Yesterday, the contract rose 73 cents, or 1 percent, to $74.28. Aug. 4 (Bloomberg) -- Gold rose to the highest in eight weeks on speculation that the dollar will weaken after touching a 10-month low yesterday, boosting demand for alternative investments. Silver climbed to a seven-week high. Gold climbed after the dollar slid yesterday to the lowest since Sept. 29 against a basket of six currencies, and following a report that gold-coin output by the U.K.’s Royal Mint soared 86 percent in the first half. The dollar was little changed against the euro as a report showed pending U.S. home sales rose more in June than forecast, curbing demand for haven assets. Gold futures for December delivery rose $10.90, or 1.1 percent, to $969.70 an ounce on the New York Mercantile Exchange’s Comex division. Earlier, the price reached $972.70, the highest for a most-active contract since June 5. Bullion for immediate delivery in London advanced $10.15, or 1.1 percent, to $966.95 an ounce after earlier touching $970.47, the highest since June 5. As demand surged for bullion to diversify investments, the Royal Mint’s second-quarter gold-coin output doubled to 16,910 ounces from a year earlier, according to data obtained by Bloomberg News under a Freedom of Information Act request. First-half production jumped to 45,406 ounces, the figures show. The metal climbed to $960.50 an ounce in the London afternoon “fixing,” the price used by some mining companies to sell their output, from $953.50 in the morning fixing. The London spot price, which reached a record $1,032.70 in March 2008, has gained in each of the past three weeks. Gold is poised for a “big breakout” by the end of September, Donald W. Doyle, the chief executive officer of Blanchard & Co., a retail coin and bullion dealer in New Orleans, said today in a statement. He said the price may top the record $1,033.90 for New York futures reached in March 2008. The metal advanced 3.1 percent last month in New York as the U.S. Dollar Index, the six-currency basket that includes the euro, yen and U.K. pound, slid 2.2 percent. Gold typically gains when the greenback slips. By closing above $960, gold has broken past a point where sellers clustered earlier and may rise to as much as $981 before running up against another spate of sales, brokerage firm GoldCore Ltd. in Dublin said today in a note. Silver for September delivery climbed 44.3 cents, or 3.1 percent, to $14.695 an ounce in New York, after earlier touching $14.765, the highest for a most-active contract since June 15. Aug. 5 (Bloomberg) -- The dollar traded near its lowest level against the euro this year before a private report that economists said will show U.S. companies eliminated fewer jobs in July, reducing demand for safer assets. The euro approached a seven-week high versus the yen on speculation a European report will show retail sales rose in June, adding to signs the recession in the 16-nation region may be abating. The pound traded near its strongest in nine months versus the dollar on prospects U.K. data may show the pace of contraction in manufacturing slowed in June. “It’s more likely that we will continue to see better economic figures than worse ones,” said Masafumi Yamamoto, head of foreign exchange strategy for Japan at Royal Bank of Scotland Group Plc in Tokyo. “That should support risk appetite,” drawing money away from the dollar and the yen. The dollar traded at $1.4415 per euro at 9:16 a.m. in Tokyo, from $1.4408 in New York yesterday. It declined to $1.4445 on Aug. 3, the weakest since Dec. 18. The yen fetched 137.37 per euro from 137.21, after falling to 137.60 yesterday, the lowest since June 15. Japan’s currency was at 95.29 per dollar from 95.23. The pound traded at $1.6946 from $1.6939. It touched $1.7004 yesterday, the highest since Oct. 21. U.S. companies cut an estimated 350,000 workers from payrolls in July after a reduction of 473,000 in June, according to a Bloomberg News survey of economists. The report from ADP Employer Services is due later today. The National Association of Realtors yesterday said pending home resales increased 3.6 percent in June after a revised 0.8 percent gain in May. The median forecast of 35 economists surveyed by Bloomberg News was for a 0.7 percent advance. “If this week’s events don’t dent expectations for a global economic recovery and risk appetite is sustained then the U.S. dollar will likely remain under pressure,” John Kyriakopoulos, Sydney-based head of currency strategy at National Australia Bank Ltd., wrote in a research report. The euro extended last week’s advance against the yen as retail sales in the 16-nation euro area rose 0.3 percent in June following a 0.4 percent decline in May, a separate Bloomberg survey showed. The European Union’s statistics office in Luxembourg will release the data today. The European Central Bank cut the main refinancing rate to 1 percent and began buying as much as 60 billion euros ($86.5 billion) of covered bonds to stimulate lending and boost the economy. The ECB will keep the rate unchanged when it meets tomorrow, according to all 52 economists surveyed by Bloomberg. The pound may gain for a fifth day against the dollar as the U.K.’s Office of National Statistics is likely to say today manufacturing output fell 0.1 percent from May, after a 0.5 percent contraction in April, another Bloomberg survey showed. The Nationwide Building Society said today its index of U.K. consumer confidence rose to 60 in July, the highest since May 2008 and up from 59 in June. The figures add to evidence that Britain has passed the worst of the recession. Bank of England policy makers will tomorrow decide whether the recovery is strong enough after five quarters of contraction for the central bank to ease off on its program of buying bonds with newly created money. The U.K. currency has strengthened 16 percent against the greenback this year and gained 22 percent versus the yen, according to data compiled by Bloomberg. CPO 3rd month Oct futures contract marginally close RM9 points higher as compare to previous trading session to close at RM2304 with a total of 11,204 lots traded in the market. CPO price was traded lower despite opened higher due to soybean oil and crude oil strong overnight trading. Technically, CPO seems fails breach to previous high resistance levels at RM2349 regions during trading session while manage to reach 123.6% Fibonacci projection levels at RM2335 regions. Based on our technical analyst, our opinion suggests CPO price might retrace slightly where support seen at RM2237 and RM2170 regions. 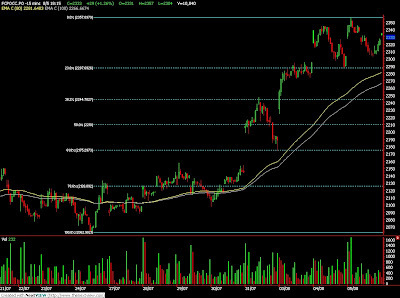 Traders were advice to hold short position provided resistance levels at RM2330 and RM2350 were not violated. FKLI Aug Futures contract fall 2 points to settle at 1170.5 levels as compare to previous trading session to with a total of 5,555 lots traded in the market. 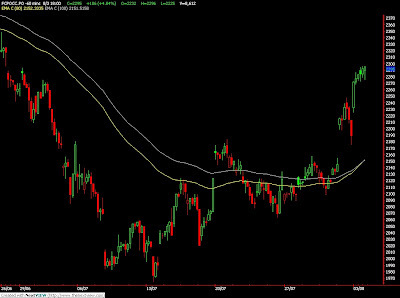 FKLI was traded lower despite Dow Jones overnight trading and regional indices were firm against the selling pressure. Technically, FKLI lacks of follow through buying interest despite manage to break above symmetric triangle resistance trend line. 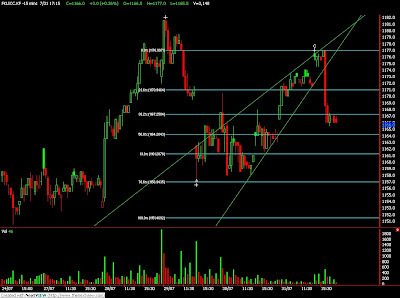 However, FKLI manage to reach 100% Fibonacci projection levels at 1179. Based on our technical analyst, our opinion suggests FKLI would trade lower only provided resistance levels at 1179 and 1182 were not violated. 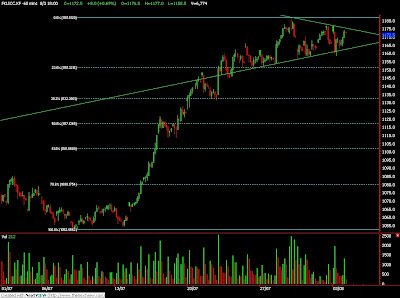 Traders were advice to hold short position while be cautious around support levels at 1170 and 1163. Aug. 4 (Bloomberg) -- Gold declined on speculation that the metal’s rise to an almost two-month high may cause investors to sell some of their holdings. Bullion, which touched $962.51 an ounce yesterday, the highest since June 10, snapped a three-day gain as the dollar rebounded against a basket of six major currencies from a 10- month low. A stronger U.S. currency saps demand for commodities priced in dollars. Gold for immediate delivery fell 0.2 percent to $954.60 an ounce at 2:20 p.m. in Singapore. Bullion is up 8.2 percent this year. Dollar Index added 0.1 percent to 77.71 after a 1 percent decline yesterday and the MSCI Asia Pacific Index of regional shares rose for a fourth day. Against the backdrop of weak physical demand, firming equities and low inflation, the gold price is “too high” and may undergo a correction in the medium term, Eugen Weinberg and other analysts with Commerzbank AG wrote in a note yesterday. Meanwhile, Sino Gold Mining Ltd., owner of China’s second- largest gold mine, plans to double production of the precious metal by 2012, Chief Operating Officer Cobb Johnstone said yesterday at a conference in Kalgoorlie, Western Australia. The Eastern Dragon mine, to start in late 2010, will produce an average of 90,000 ounces a year at a cost of $125 per ounce for at least five years, Cobb said. He didn’t say what the targeted output was, or the comparison for the doubling projection. Gold holdings in the SPDR Gold Trust, the biggest exchange- traded fund backed by bullion, were unchanged at 1,072.87 metric tons as of Aug. 3, according to data on the company’s Web site. Among other precious, silver was down 0.4 percent at $14.26 an ounce, platinum declined 0.2 percent to $1,233.50 an ounce and palladium rose 0.3 percent to $273.25. Aug. 4 (Bloomberg) -- Palm oil futures advanced a fourth day as the world’s cheapest edible oil, which can also be used in biofuels applications, tracked a rally in crude oil. “Bio-diesel demand varies sharply from month to month,” responding to crude oil prices, James Fry, managing director of UK-based agricultural industry consultant LMC International Ltd., said in a presentation e-mailed today. A combination of “$70 crude oil and tight Malaysian stocks implies prices will move above $800 by December,” he added. Palm oil for October delivery on the Malaysia Derivatives Exchange gained 2 percent to 2,341 ringgit ($670) a metric ton at the 12:30 p.m. trading pause. The contract has advanced 11 percent in four days. If the contract sustains today’s advance, it will be the longest and steepest winning streak since a four-day gain of 15 percent ended April 14. Crude oil traded in New York surged 13 percent in the past three trading days and last traded at $71.21 a barrel. Palm oil is used mainly in food and any increases in bio- diesel demand would support prices as “my latest forecasts point to an unusually small seasonal rise in stocks,” Fry said. Stockpiles in Malaysia, the second largest producer, expanded for a second month in June, rising 2.5 percent to a four-month high of 1.41 million tons, according to the country’s Palm Oil Board. July numbers will be announced next week. Palm oil has averaged $610 a ton this year, while crude oil has averaged $53.83 a barrel, according to Bloomberg data. Crude oil has jumped 60 percent this year, while palm oil has added 37 percent. An average Brent crude price of $65 a barrel would “imply that palm oil prices will approach $800 by the year-end,” Fry said in the presentation. Aug. 3 (Bloomberg) -- The Organization of Petroleum Exporting Countries increased oil output for a fourth straight month in July, reducing compliance with quotas as some members took advantage of rising prices, a Bloomberg News survey showed. Oil output averaged 28.39 million barrels a day last month, up 45,000 from June, according to the survey of oil companies, producers and analysts. The 11 OPEC members with quotas, all except Iraq, pumped 26.035 million barrels a day, 1.19 million more than their target. Crude futures have more than doubled since falling to a four-year low of $32.40 a barrel at the end of last year, which forced OPEC to cut output. Oil traded above $70 today for the first time in a month on signs industrial output is picking up, potentially triggering a recovery in fuel demand. OPEC agreed at three meetings last year that the members with quotas would cut output by a combined 4.2 million barrels a day to 24.845 million in a bid to bolster prices. The group is due to meet and discuss production levels in Vienna on Sept. 9. The United Arab Emirates raised output by 40,000 barrels a day to 2.27 million barrels a day, the biggest increase of any member last month. The gain left production 47,000 barrels a day above the country’s quota. Algerian production climbed 35,000 barrels to an average 1.285 million barrels a day in July, the second-biggest increase of any member. The country pumped 82,000 barrels a day above its quota last month. Saudi Arabia, Kuwait and Qatar were the only OPEC members to keep within their targets in July. Saudi Arabia, the world’s biggest oil exporter, pumped 8.02 million barrels of crude a day, unchanged from the previous month, the survey showed. The country may cut the official price of its Light oil for September sales to Asia, spurring purchases of the fuel, refinery officials said today. Kuwaiti output rose 25,000 barrels a day to 2.2 million, according to the survey. Output was 22,000 barrels a day lower than the country’s quota. Qatar, the second-smallest producer in the group, pumped 705,000 barrels a day in July, up 10,000 barrels from June and 26,000 barrels below its target. Iranian output fell 10,000 barrels a day to 3.79 million in July, the report showed. June production was revised 50,000 barrels higher. The country, OPEC’s second-biggest producer, pumped an average 454,000 barrels a day above its target, according to the survey. Iran, the member that’s least compliant with output limits, according to the survey, expects oil prices to reach $80 a barrel by the end of the year on “optimistic” signs in the market, the country’s OPEC Governor, Mohammad Ali Khatibi, said. Angola increased production by 20,000 barrels to 1.81 million barrels a day. The gain left output 293,000 barrels above the nation’s target, the second-biggest excess in the group. Output in the African country surpassed Nigeria’s for the first time since June 2008. Venezuela raised output by 10,000 barrels to 2.21 million barrels a day. The South American country pumped 224,000 barrels a day above its target of 1.986 million last month, the survey showed. Nigeria’s production slipped 100,000 barrels to an average 1.75 million a day in July because of attacks by militants on oil facilities in the country’s Niger River delta. It was the biggest decline by any OPEC member and left Nigerian output at the lowest level since August 1994. The Movement for the Emancipation of the Niger Delta, the country’s main militant group, declared a 60-day cease-fire in its campaign targeting oil and gas installations on July 15 after authorities freed leader Henry Okah. Violence in the region intensified in May when the government started an offensive against MEND bases. Iraqi oil output fell 15,000 barrels to 2.355 million barrels a day in July, according to the survey. The country exported an average 2.037 million barrels of oil a day, the highest since the U.S.-led invasion in 2003, Assim Jihad, an Oil Ministry spokesman, said in a telephone interview today. Iraq pumped about 2.5 million barrels a day last month, Jihad said. Aug. 4 (Bloomberg) -- Crude oil traded near a seven-week high after rising yesterday as increased industrial activity bolstered optimism that fuel consumption will rebound. Oil gained after reports showed that U.S. manufacturing shrank at the slowest pace in 11 months and factory output in China advanced to the highest level in almost a year. The Standard & Poor’s 500 Index climbed above 1,000 for the first time since November, prompting speculation raw-material demand and prices will increase. “Better-than-expected manufacturing numbers here in the U.S. and more growth numbers released from China helped support the continued rally in the equities and commodities markets,” Mike Sander, an investment adviser with Sander Capital in Seattle, said by e-mail. Crude oil for September delivery traded at $71.20 a barrel, down 38 cents, on the New York Mercantile Exchange at 9:33 a.m. Sydney time. Yesterday, it rose $2.13, or 3.1 percent, to $71.58, the highest settlement since June 12. The U.S. Institute for Supply Management said yesterday its manufacturing index climbed to 48.9 last month from 44.8 in June. An increase to 46.5 was expected, according to a Bloomberg News survey of economists. CLSA Asia-Pacific Markets said yesterday its index of China’s manufacturing rose to a one-year high as stimulus spending stoked domestic demand. China accounts for about 45 percent of Asia’s oil use. The S&P 500 added 1.5 percent to 1,002.63 in New York, the highest level since President Barack Obama was elected on Nov. 4. The Dow Jones Industrial Average rallied 1.3 percent. “The S&P 500 hitting 1,000 is a clear indication investors are optimistic for a complete economic recovery,” Sander said. U.S. crude inventories probably rose 1.15 million barrels in the week ended July 31, according to the median of 12 estimates by analysts surveyed by Bloomberg News before an Energy Department report tomorrow. Nine of those surveyed said stockpiles rose and three forecast a drop. Gasoline supplies probably fell 1.25 million barrels from 213.1 million the week before, according to the survey. Gasoline for September delivery traded at $2.0618 a gallon in New York, down 0.75 cents, at 9.33 a.m. in Sydney. Yesterday, it increased 5.67 cents to end the session at $2.0693. Brent crude oil for September settlement gained $1.85 yesterday to $73.55 a barrel on London’s ICE Futures Europe Exchange. Aug. 3 (Bloomberg) -- Gold climbed to the highest in almost two months as a weaker dollar boosted demand for the metal as an alternative investment. Silver reached a seven-week high. The U.S. Dollar Index, a six-currency gauge of the greenback’s strength, slid as much as 1.1 percent to a 2009 low as gains in manufacturing in the U.S., China and the U.K. reduced demand for a haven. Gold tends to rise when the dollar falls. The metal touched $1,007.70 an ounce, this year’s high in New York, on Feb. 20. “This week will be a battle between a chart that appears bullish and fundamental indications which are bearish,” Tom Pawlicki, an MF Global Inc. analyst in Chicago, said in a note. “The market has seen outflows from gold ETFs, disappointing physical demand, low inflation potential and poor economic growth,” he said, referring to exchange-traded funds. Gold futures for December delivery climbed $3, or 0.3 percent, to $958.80 an ounce on the New York Mercantile Exchange’s Comex division, after earlier touching $966.90, the highest for a most-active contract since June 5. “Dollar weakness and a recovery in risk appetite could push the metal higher,” Pradeep Unni, an analyst at Richcomm Global Services in Dubai, said in a report. The dollar index fell for a third straight session after July’s 2.2 percent drop. Bullion for immediate delivery in London rose $2.65, or 0.3 percent, to $956.65 an ounce at 7:27 p.m. local time. Gold advanced to $959.75 an ounce in the London afternoon “fixing,” the price used by some mining companies to sell their output, from $954.25 in the morning fixing. The weakening dollar and “positive economic sentiment” make a bullish case for gold, David Wilson and Stephanie Aymes, Societe Generale analysts, said today in a note. Wilson and Aymes also said they’re bullish on silver because of a rally in base metals and continuing investor interest. Silver for September delivery rose 31.2 cents, or 2.2 percent, to $14.252 an ounce in New York. Earlier, the metal touched $14.465, the highest for a most-active contract since June 15. Equity indexes climbed from New York to Hong Kong as data showed manufacturing expanded in China by the most since July 2008, while in the U.S., factory activity declined by less than forecast. For the first time in more than a year, manufacturing expanded in the U.K. last month, industry data showed today. The International Monetary Fund probably will sell 200 metric tons of gold annually starting next year, “potentially weighing on prices,” Citigroup Inc. said in a July 31 report. Gold will fall to $850 an ounce in the second half of 2010, Alan Heap, a Sydney-based Citigroup analyst, said in the report. Investment in the SPDR Gold Trust, the biggest exchange- traded fund backed by bullion, declined 1.3 percent last week to 1,072.9 tons on July 31, the company’s Web site showed. Hedge-fund managers and other large speculators trimmed bets on rising gold prices in the week ending July 28, according to U.S. Commodity Futures Trading Commission data. Net-long positions fell 0.3 percent to 172,771 Comex contracts, the Washington-based commission said. Aug. 4 (Bloomberg) -- The dollar traded near a seven-month low against the euro as investors sought higher-yielding currencies before a report forecast to show pending U.S. home sales rose for a fifth month. The Dollar Index was near a 10-month low ahead of the June home sales report and after the Institute for Supply Management said U.S. manufacturing shrank in July at the slowest pace in 11 months, sapping demand for safer assets. The yen was near the lowest in seven weeks versus the euro on speculation a rally in stocks will damp demand for safe-haven currencies. The dollar traded at $1.4417 per euro as of 8:30 a.m. in Tokyo from $1.4412 in New York yesterday, when it fell to $1.4445, the lowest level since Dec. 18. The yen bought 137.25 per euro from 137.31. It reached 137.56 yesterday, the weakest since June 15. The yen fetched 95.21 per dollar from 95.26. The Dollar Index, which the ICE uses to track the dollar against currencies of six major U.S. trading partners including the euro and the yen, dropped to as low as 77.451 yesterday, the weakest since Sept. 29. U.S. pending home resales probably rose 0.7 percent in June after a 0.1 percent gain in May, based on a Bloomberg News survey of economists. The National Association of Realtors will release the report at 10 a.m. New York time. The Institute for Supply Management’s factory gauge yesterday rose to an 11-month high of 48.9 in July, according to the Tempe, Arizona, group. Readings below 50 signal contraction. U.S. equities rallied yesterday, sending the Standard & Poor’s 500 Index above 1,000 for the first time since November, on growing speculation the recession is ending. Benchmark interest rates of as low as zero in the U.S. and 0.1 percent in Japan compare with 3 percent in Australia and 2.5 percent in New Zealand. Japan’s currency has fallen 2.5 percent against Australia’s dollar and 2.2 percent versus New Zealand’s dollar in the past week on speculation investors sought higher returns in the South Pacific nations’ assets. The Canadian dollar and the Norwegian krone, currencies sensitive to changes in raw-material prices, advanced as crude oil traded above $71 a barrel for the first time in a month. Canada’s currency appreciated as much as 1.2 percent to C$1.0643 per U.S. dollar yesterday, the strongest level since Oct. 2. Norway’s krone touched 6.0069, the strongest since Oct. 3. Commodities account for more than half of exports in Canada, while Norway is the world’s fifth-largest oil producer. Nouriel Roubini, the New York University economist who predicted the financial crisis, told a mining conference in Australia yesterday that commodities may extend their rally in 2010 as the global recession abates. “Commodity currencies seem to be back with a vengeance,” said Jack Iles, who oversees $2.5 billion assets at MFC Global Investment Management in Boston. “The dollar is getting pounded.” Iles said he bought the euro and the Australian dollar versus the greenback a few weeks ago. FKLI Aug Futures contract surge 8 points to settle at 1172.5 levels as compare to previous trading session to with a total of 6,774 lots traded in the market. FKLI was trade volatile as regional indices and Dow Jones electronic trading was traded high despite was traded low during morning sessions. Technically, FKLI seems formed a symmetric triangle in the hourly chart while daily chart more prone to consolidation phase within range from 1177 to 1160 regions. Based on our technical analyst, our opinion suggests FKLI still possible riding on bull rally as long as support levels at 1160 and 1153 were not violated. However, traders were advice to enter position once resistance levels at 1177 and 1182 were breached. CPO 3rd month Oct futures contract surge RM106 points higher as compare to previous trading session to close at RM2295 with a total of 8,612 lots traded in the market. CPO price was trade strong as crude oil and soybean oil were traded firm during overnight and electronic trading sessions. Technically, CPO price breached all our previous resistances levels at RM2225 and RM2263 regions and daily bar show a strong bullish candlesticks upon closing. Based on our technical analyst, our opinion suggests CPO possible already trend reverse upwards provided support levels at RM2183 and RM2063 were not violated. 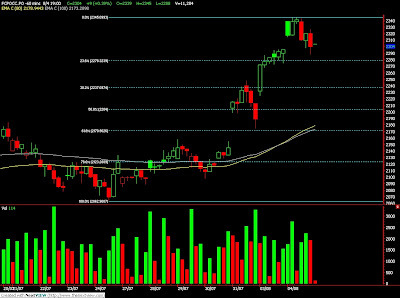 Traders were advice to hold long position once resistance level at RM2308 was violated. Next resistance levels were seen at RM2350 regions. Aug. 3 (Bloomberg) -- Palm oil futures gained a third day, the longest winning streak in three months, tracking advances in crude oil and soybeans. Crude oil surged 9.6 percent in the past two trading days and extended gains in Asian trading today. Vegetable oils, which are used as biofuels, often track crude. October-delivery palm oil soared as much as 4.3 percent to 2,284 ringgit ($651) a ton on the Malaysia Derivatives Exchange. Futures have gained 7.9 percent in three days, the longest such stretch of gains since the period ended May 4. The commodity paused at 2,279 ringgit at the midday break. November-delivery soybeans surged as much as 5.1 percent in after-hours trading on the Chicago Board of Trade, extending last week’s 7.3 percent advance. It was at $10.17 at 12:26 p.m., the first time in a month that it’s above $10 a bushel. The oilseed is crushed for meal for animal feed and oil for cooking, palm oil’s main substitute. Soybean oil ended last week with a 27 percent premium over palm oil, according to Bloomberg. Investors are looking to record U.S. soybean harvest to make up for shortages caused by the drought in South America. The U.S., Brazil and Argentina are the largest growers of the oilseed. “Soybean supply concerns are more prevalent,” said Ben Santoso, an analyst at DBSVickers Securities (Singapore), by telephone today. “Indiana is recording the coolest temperature in 112 years and crops are way behind schedule,” he said. FKLI July Futures contract rebound 3 points to settle at 1166.5 levels as compare to previous trading session to with a total of 3,148 lots traded in the market. FKLI was traded sideways near the top side but plunge south in 2nd trading session despite Dow Jones futures and regional indices were traded firm during trading sessions. Technically, FKLI seems rebound 78.6% Fibonacci retrace levels at 1176.5 regions and plunge after break down from the rising wedge. Based on our technical analyst, our opinion suggests FKLI still undergoing correction phase despite manage to rebound unexpectedly high. Correction phase remain intact provided resistance levels at 1178 and 1182 region must not be violated. Traders were advice to hold short position around 1170 and 1172 levels while be extra cautious around support levels at 1161 and 1151 levels. CPO 3rd month Oct futures contract close RM44 points higher as compare to previous trading session to close at RM2189 with a total of 12,690 lots traded in the market. CPO price was traded higher in earlier trading session but traded south in 2nd trading session due to strong profit taking activities over long holiday. 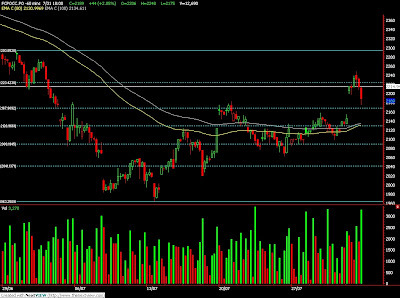 Technically, CPO price manage to rebound exit 78.6% Fibonacci resistance levels at RM2225 regions. Based on our technical interpretation, our opinion suggests CPO price would encounter strong resistance levels at RM2225 and RM2262 regions. Traders were advice to hold short position provided resistance levels were not violated while be cautious around support levels at RM2180 and RM2130 levels.